Sea Salt contains skin nourishing minerals such as magnesium, zinc, calcium and potassium. Using this spa bar will leave your skin feeling renewed and refreshed. 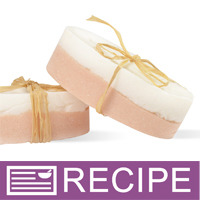 This project and these instructions have been written for someone who has experience making soap and knows the potential dangers due to working with sodium hydroxide. It will not outline safety methods of working with dangerous chemicals, it is simply a soap recipe for advanced soapmakers. Divide the European Spa Salts - Fine Grain into two bowls of 10 oz. each. Weigh ingredients. Working in a sink, carefully and gradually pour Sodium Hydroxide into Distilled Water, stirring between pouring. In the microwave on high heat for about 1 minute 30 seconds, melt butters and oils. Be sure to use a bowl that is aluminum-free for soaping. In two separate cups, reserve a small amount of oil, about 1 ounce. Mix the Matte White Pigment Powder in one cup and the Orange Illite Clay in the other until they are well blended. When both the lye/water and oils are around 100°F, you are ready to begin soaping. Place your immersion blender in the oils and tap on the bottom of the bowl to "burp" it. Slowly and carefully pour your lye water over the shaft of the blender. Blend your ingredients until they come to a light trace. Add your fragrance oil to your batter and hand stir with a spatula. Add the white colored oils to your traced soap batter and hand stir or blend. Place a separate container on a scale and tare. Pour 14 oz. of batter into the separate container. Mix in the orange reserved oil to ONE of the bowls of soap. Pour one 10 oz. bowl of European Spa Salts into the orange soap batter and stir. The batter will become very thick. Fill 7 of the oval mold cavities halfway with the orange salt soap batter. Tap molds on the counter to even out the soap and make sure there are no air bubbles. Pour the second bowl of European Spa Salts into the white soap batter and stir. Pour the white salt soap batter on top of the orange soap. Tap molds on the counter. Cover both molds with plastic food wrap and set aside to saponify. After 24 hours the bars will be ready to unmold. Allow to cure for 4 weeks. Wrap with raffia if desired. "Can you use regular lye instead of flakes? If so do I need to adjust the amount?" Staff Answer We are not sure what is meant by regular lye. Our sodium hydroxide comes in flake form but would be the same as pellets, etc. that are available from other companies. "Hello - Is this the standard formulation when making salt cp soap bars? I am also wondering why such a high percentage of coconut oil and no palm oil. I want to make salt soap bars with my standard formulation of 32/32/32/4 coconut oil, palm, olive and castor, and then just add the salt, but it looks like the water and lye amounts are less than normal also. Also - does the salt decreases lather/bubbles in cp soap? Thanks in advance for your help. " Staff Answer This is the recipe our staff came up with. You can certainly choose to use your own recipe if you like. This bar came out very nicely. More coconut oil was used to make a more bubbly bar since the salt does decrease the lather. "Am I able to do this w/the M&P soap?" Staff Answer This recipe was designed for CP Soap only. "Do you leave these open to air like regular CP soap or package them in bags or something else for longer shelf life? " Staff Answer Allow 4-6 weeks to cure. "Can I make this in a loaf and slice it instead of using the oval molds?" Staff Answer Yes, you can. Salt bars do get very hard very quickly and can be a bit crumbly when made in a loaf thus making it difficult to slice. We chose to make individual bars to avoid these issues. "Do these lather well? I have made salt bars before but they were a crumbly mess. How do these seem? Thank you"
I have experimented with Salt bars and have found that you can not use Dead Sea salt, as the mineral content is too high = crumbly mess with little to no soap. Himalayan salt works well and has a pretty pink tint and of course Natural Sea salt works wonderfully.